UPDATED: Taxi drivers at Adelaide airport have called off a protest sparked by issues surrounding access given to Uber drivers. It’s understood that a group of taxi drivers have called off their blockade of the ride sharing pick-up area and part of the taxi rank early on Friday afternoon, after they earlier refused to pick up passengers in response to the airport’s decision to allow UberX to operate within the precinct. The State Government was forced to put on extra bus services last night and this morning as taxis drivers blockaded both the UberX pick-up area and the taxi rank. As InDaily reported first yesterday, Adelaide Airport has lifted a ban on UberX drivers picking up passengers from the airport, prompting an angry response from drivers and the State Government. Taxi Council president Jim Triantafyllou pleaded with drivers not to block the rank this morning, but was unsuccessful, with the airport calling in a “heavy” police presence to monitor the volatile situation. He said while he supported drivers’ right to demonstrate against “illegal operators”, he did not support a blockade. Transport Minister Stephen Mullighan this morning slammed the airport for surprising both him and drivers with yesterday’s announcement. “I think the Adelaide Airport’s got a lot of questions to answer about why, without any notice, they dropped this on the taxi industry,” he told ABC Radio Adelaide. However, the airport insists Mullighan and the Taxi Council have been kept informed and were aware that a lifting of the UberX ban was imminent. Adelaide Airport’s executive general manager of finance and corporate, Brenton Cox, said while the protest had not affected drop-offs, the capacity of UberX and taxi drivers to pick-up passengers had been restricted with public and private buses called in to help arriving passengers. “It’s a terrible look for the city and the state,” Cox told InDaily. He said ride-sharing was legal in South Australia and it would be “perverse” for the airport to continue to ban UberX from picking up passengers. Cox said Mullighan’s criticism was unfair and he knew that the UberX decision was coming. “We have been engaged with every stakeholder and that includes the minister,” he said. The airport came to a final agreement with UberX overnight on Wednesday and the minister and the taxi industry had been informed on Thursday morning. Mullighan said the situation could have been avoided if the airport had worked more closely with the taxi industry. 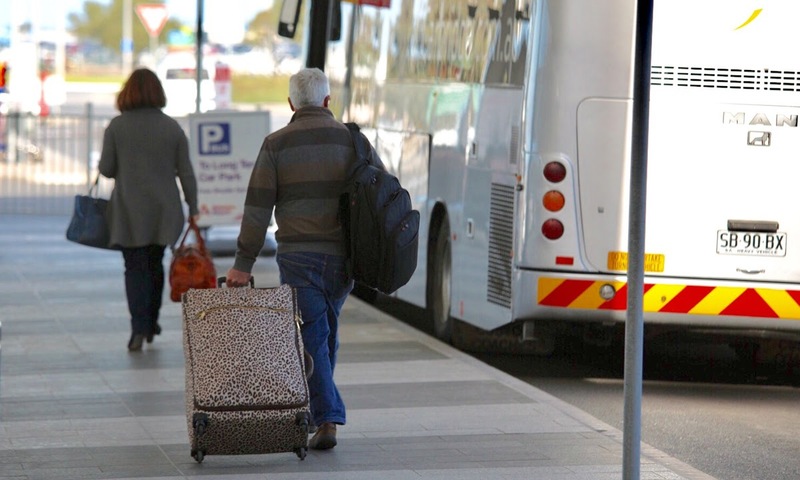 “The State Government is now working with Adelaide Airport, the taxi industry and police to manage the situation and to try and minimise disruptions to passengers arriving at Adelaide Airport,” he said in a statement. Cox warned the airport had identified the individual taxi drivers involved in today’s blockade and would ask police to intervene if members of the public were impeded. “We will be in close discussions with the authorities on that,” he said. Triantafyllou said the move to allow Uber at the airport was disappointing and he had concerns about the accreditation of drivers. “It’s our understanding that only a handful of UberX drivers have sought and secured their accreditation to operate in the ride sourcing market,” Triantafyllou said. Uber’s more expensive “black” service was already available from the airport. Adelaide airport joins Sydney, Perth, Canberra and Perth airports in allowing the ride sharing app.